EXCITING MULTI MEDIA AND MUSIC TRAINING OPPORTUNITY FOR YOUNG PEOPLE. Glasgowbury ready to launch “I AM” Project! The ‘I AM’ project, Inclusive Accessible Multi Media, is a personal youth development initiative, aimed at 16-25 year olds and will focus on building confidence, self-esteem and developing skills through a 12-month creative training programme. The founder of Glasgowbury Paddy Glasgow is “over the moon” with being awarded almost £90,000 from the International Fund for Ireland (IFI) to deliver this innovate training opportunity in the creative industries for young people of Mid Ulster. The participants will come along to Glasgowbury’s award winning “Cornstore Creative Hub” in Draperstown, 2 days a week, where they will be instrumental in shaping the programme and exploring opportunities to unlock their individual potential in a fun and safe creative environment. Training activities to include Podcasting, Film Making, Music Production, DJing, Photography, Songwriting. Other arts activities like painting and pottery can also be explored. Trainees will also go on a team building ‘residential’ and ‘study visits’ to film and music studios and get a taste of what it’s like to work in the creative industries. All trainees will be awarded a personal iPad on which to facilitate their learning and will be theirs to keep when training completed. Music and digital technologies will be used to encourage participants to address issues of isolation and to develop self-esteem and confidence, through both OCN accredited and non-accredited training. Completion of the course would enable participants to pursue further education or employment in the music and multimedia industries. The promoter of Glasgowbury Music Festival, which ran for 13 years until 2013, said “a lot of organisations had been in for the award and we are grateful that IFI have recognized the potential of our organisation and the project to give young people from Mid Ulster this opportunity to explore the growing creative industries.” The project is open to young people who have some or no previous experience to take part. 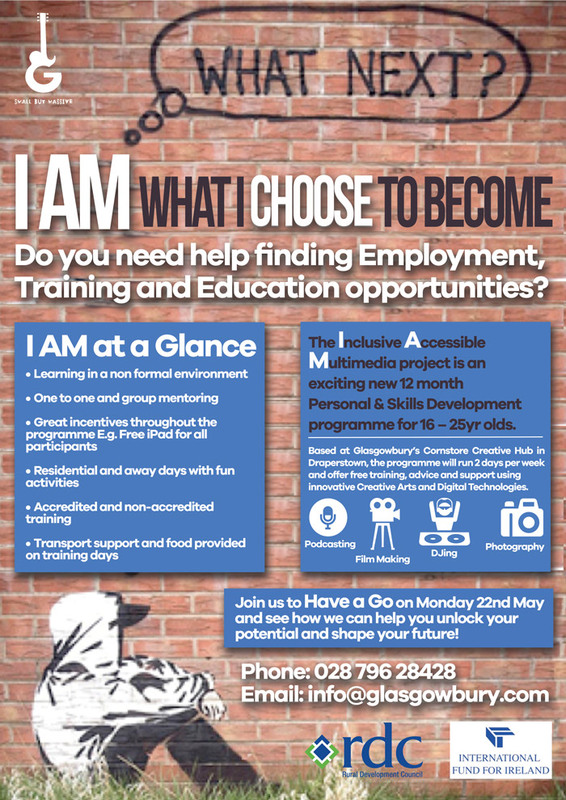 Glasgowbury are hosting a ‘Have a Go’ day on Monday 22nd May at the “Creative Hub” in Draperstown from 10.30am to 2pm where potential participants can come along and explore their options. The ‘I AM’ programme will begin on 30th May. The project is open to 16-25 year olds who are currently not in full time employment, education or training. Transport assistance provided as needed. Anyone interested are encouraged to get in touch with Glasgowbury as soon as they can as spaces are filling up fast! Contact details below or call into the creative hub for a chat.